Content Bloom is pleased to announce the launch of an exciting new product that brings the ease and convenience of your favourite app store to SDL Tridion. The brainchild of Alexander Klock, the master coder who gave the world the Razor Mediator for Tridion, Alchemy is a new system set to revolutionize the way Tridion eXtensions are built and installed. 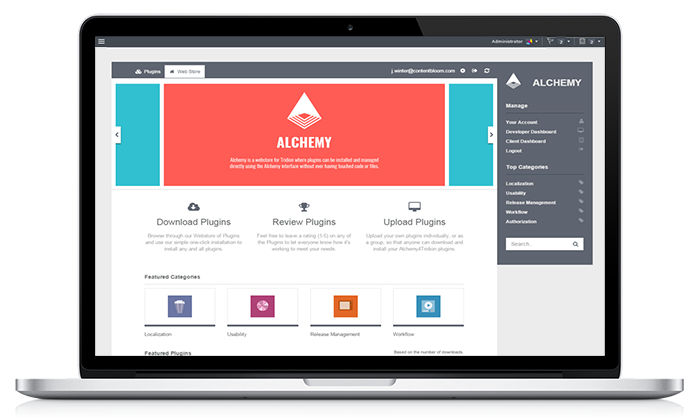 Not only does www.alchemywebstore.com and the Alchemy4Tridion eXtension provide one click access to a number of fully developed and tested plugins to add a range of new functionalities to your Tridion instance, but with the Alchemy framework anyone can develop and share new plugins with unheard of ease. Once installed (a simple process that can be done in under a minute), Alchemy4Tridion allows anyone, regardless of his or her technical expertise to browse the full list of plugins, then install with a single click. Meanwhile, the Alchemy framework for plugin development streamlines and simplifies the process of building Tridion eXtensions and provides a means of building or converting eXtensions in a way that is compatible with the Alchemy webstore, meaning they can be easily shared, installed, reviewed and rated. Currently in its Public Beta testing phase, Alchemy is ready for the community to start exploring. By participating now during the testing phase you will have the chance to see the product early and provide feedback on features you would like to see in the final version. In exchange, we ask that you be patient and recognize that this is a tool that’s still under development. If you find a bug, a missing feature or a chance for us to improve, we hope that you’ll share that with us and help us to provide the best possible product for the community. For more information on this testing phase and how you can get involved, please visit http://www.alchemywebstore.com/testing. We at the Alchemy team are extremely excited for the possibilities our work provides for the Tridion community and hope that you’ll participate by downloading and developing plugins, making Alchemy into an invaluable tool for everyone working with SDL Tridion. Content Bloom designs and implements large-scale web solutions using enterprise content management systems and cutting edge technologies to provide measurable value to our customers. We do this by understanding our customer’s goals and crafting unique solutions that help to achieve them. Our organization believes in continuously investing in the growth and development of our team and the wider web community, which allows us to remain at the forefront of our field and provide the best possible results for our clients. Content Bloom has offices in North America and Europe serving Fortune 500 companies, governments and organizations around the globe. This entry was posted in A4T, Community, Extensions, Tridion news, UI by Tanner Brine. Bookmark the permalink.